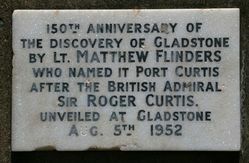 The Flinders Memorial commemorates the 150th anniversary of the discovery of Gladstone in 1802 by Matthew Flinders. In the presence of about 100 people, the historic ceremony of unveiling the Matthew Flinders Memorial took place on the foreshores of Port Curtis near the Harbour Board office last Tuesday. Noted guests present included the secretary of the Royal Geographical Society (Mr. D. O'Brien), who after congratulating the Town Council and residents of Gladstone, said the memorial though not the largest, was the prettiest he had seen. He said the society would have its £2000 equipment brought to Gladstone to take photos of the natural beauty of local scenes. After the Mayor (Ald O'Malley) had read telegrams from the Royal Historical Societies of Australia and Victoria seeking to be associated with the ceremony, Ald. W. H. Golding, who has devoted many years in compiling the early history of Gladstone, detailed the early voyages made by Flinders from Britain to Australia, drawing particular attention to his instructions from the Admiralty to prosecute a search for harbours, rivers and even creeks which might lead to the development of the new continent. He pointed out that Flinders actually entered Port Curtis through the narrow northern entrance near South End, culminating in his landing on these shores at 11 a.m. on August 5, 1802. He named Port Curtis in honour of Admiral Sir Roger Curtis. 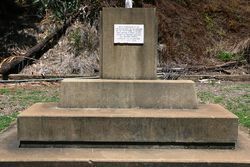 The memorial, beautifully designed in the form of seats surmounted by a decreasing column with flagpole, was the work of Brisbane architects, Hall, Phillips and Wilson, and the project was only completed on August 4 by local builders, John Young and Sons. A bubble drinking fountain has still to be added. At the ceremony, the health inspector (Mr J. B. Williamson), noted for his artistic carvings, presented a moulded plaque of Flinders and this will be displayed in the Town Hall. 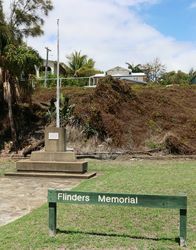 The site of the memorial is in Flinders Parade, the nearest possible to the harbour edge, and has been dedicated a park by the council and Harbour Board. It will be beautified by planting trees, shrubs and flowers. Morning Bulletin (Rockhampton, Qld), 9 August 1952.